Crispy chilli beef is a very popular Chinese available in most restaurants and takeaways in UK. Most Chinese restaurants branded this as a Sichuan dish. I have no idea how and why. This is just another British-Chinese creation, doubt if you'll find this anywhere in Sichuan China. I love anything sweet, sour and spicy, this is rather nice and I don't mind cooking it occasionally. As long as you don't mind deep frying, this is rather easy to make. Cut the beef into long and thin strips as fine as you can, best parallel to the grain. If you can't cut it parallel to the grain then cut the beef thicker if not the strips will break apart easily. Mix beef gently with egg white, light soy, 5 spice and salt and leave aside for about 15 - 20 minutes. Shred the carrot very fine and cut onion into slices. Put starch in a large bowl and throw in the beef, gently toss and mix with hands to coat beef generously with starch. Make sure to separate all the beef strips apart. Heat oil in wok till hot at medium heat, then fry beef in several batches till very crisp and light golden brown. This beef is very easy to deep fry, loosely drop in the hot oil then tease apart with a pair of long chopsticks or tongs. Continue frying till all the beef is done. 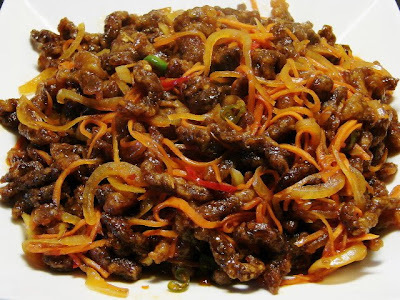 Put fried beef on paper to absorb excess fat. Remove oil and clean the wok. Heat wok and add about 2 tbsp of oil and fry onion and carrot till soften, add a small pinch of salt. Then add in chilli sauce, sliced chilli, oyster sauce, vinegar and add in about 1/2 cup of water. Let the liquid come to the boil. Taste and check if salty, can add a touch of light soy. Finally add in the fried beef, give it a quick stir till the sauce is almost all absorbed. make sure the beef is fried till quite crispy inside out, if the inside of beef is soft it will turn chewy and soft rather quickly after coating with the sauce. Do not cook the beef in sauce for too long, high heat is essential. Soon as the the beef is evenly coated it's ready to serve. 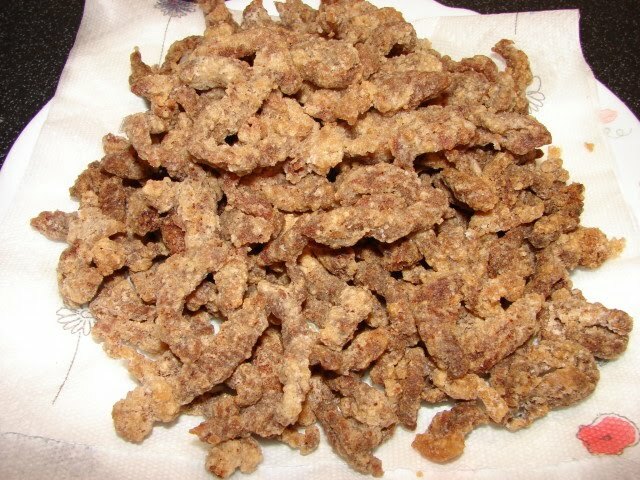 Here is a picture of the beef after deep frying. Do you get this Canada? You can make it yourself. Hope you will try the recipe. As much as I like ordering new things crispy chilli beef is a must whenever I order chinese food! Look forward to trying your recipe! Haven't came across this dish before...looks good! Sunflower, I have at long last tried one of your recipes, after having bookmarked your site and followed you through the BBC Food Boards, I tried this tonight, and it was absolutely gorgeous, even my youngest daughter (6) who has problems chewing meat came back for seconds!!! All of us loved it, and we would all like to say thanks from the Burrows Family (Aka May-Onnaise Beeb board). It's been a long time since we last chat on the Beeb board. Thanks for the feedback.